Are cookies used & how can I delete them? How do I share a Topic to Facebook ? How do I add Photos to my Photo Album? How do I get a Photo Album? Why am I receiving hundreds of Emails? How do I add my Photo into my Profile? How do I insert a Photo into my Post? All that you need to do is type the URL (https://www.maggotdrowning.com/forum/), and it will automatically be converted to a URL (https://www.maggotdrowning.com/forum/)! Recovering a Username or changing a lost password is simple, assuming that e-mail features are turned on for this forum. All of the pages that require you to identify yourself with your Username and Password carry a "forgotten Username and/or Password" link that you can use to have a code e-mailed instantly to your e-mail address of record that will remind you of your username and allow you to create a new password. Because of the Encryption that we use for your password, we cannot tell you what your password is. Firstly choose the YouTube video you wish to add and highlight the link in your address bar and copy it..
At the bottom of the Topic page.. When using the Chat Room you will be prompted to install the ActiveX Control; in order to do this your Vista UAC (User Account Control) must be set to allow Administration rights. If despite this you still cannot get the Chat Room to load you may find that you need to install Java into your computer as Vista does not include Java. Once you have a Photo Album in place, follow this easy guide to add photos to your album as the process is different to the way that you use when adding photos to a forum thread. In the smaller window that's opened click on the image file that you wish to upload into your album, then click on the OPEN button. Click on UPLOAD just above the picture and it should load up to your album. To get a free Photo Album, click on the last page of this thread: Click Here where yuo can then request one. Every now and again I receive an email from a user who has opened their mailbox to find a load of emails in there that are notifying them of new postings to the forum. The forum will not send emails out automatically unless you the user requests it to do so using the 'Subscribe to...' function. Once a user has subscribed to a part of the forum this link > My Subscriptions will then appear at the top-right of the forum. In here the user can then manage their subscriptions and unsubscribe if they wish. Also where-ever you see this symbol > you have the option to cancel the subscription to that particular part of the board or topic. When you 'Subscribe to ....' YOU are asking for an Email to be sent, We do not send them to you without your request. To add your photo into your profile, log in then click the Profile link on the top-right of the forum. In here you will need to enter your log in details and then a new window will open with your profile information in. Part way down on the left you will see a section for your Picture Details. My Photo has now been replaced with the option to attach an image or photo directly from the reply box. Hopefully this brief guide will help those that are experiencing some difficulty getting their pictures up onto the forum. Click on the image you want to upload and then click on the OPEN button. ...... confirming that your file has been uploaded and the code added to your post in the reply box. 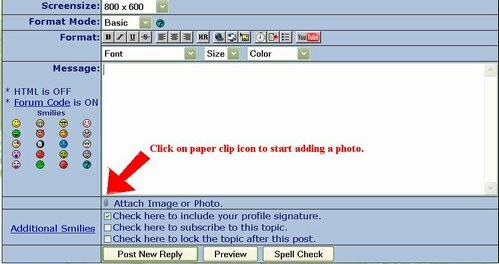 ....... by clicking on the INSERT button next to the relevant file it will insert the code into the reply box for you.